The AW100 can handle all that Mother Nature can throw at it. Take it diving to depths of up to 33-feet. Shoot at temperatures as cold as 14° F. And don't sweat drops of up to five feet. Whether it's in your hand, mounted to a surfboard, clipped on a backpack or attached to a scuba tank, every twist, splash, dive and crash can be recorded in both still and Full HD (1080p) movies. Plus, Nikon's new Action Control brings fast and easy operation to gloved hands. The AW100 lets you capture every thrilling moment from inside the action—not the sidelines. Adventure doesn't always happen during perfect photo-taking conditions. 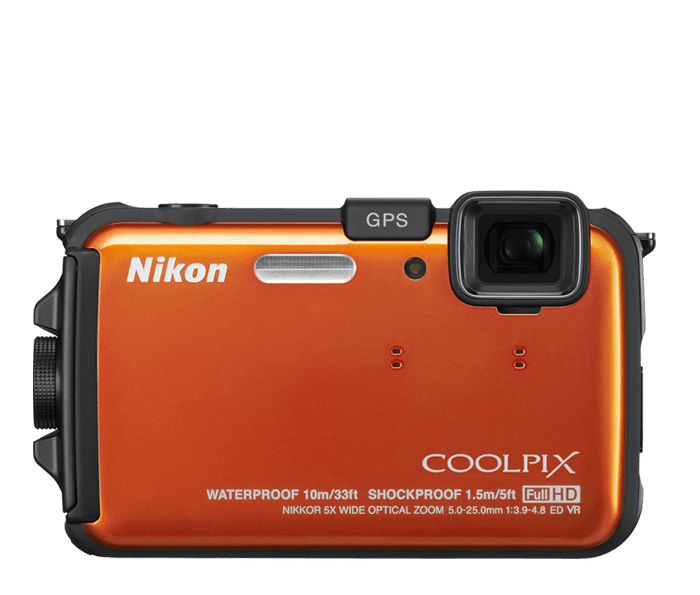 Imagine sharp images produced 33-feet underwater, photos and movies captured while you explore a dark cave, or snapshots nabbed during that last run just as the sun was setting. What does it take to get these and more? A 16.0 MP CMOS sensor that blazes through low light, fast action and challenging shooting conditions to capture high-impact photos with exceptional image quality and low noise. Shoot three shots in about one second using one-touch control for Full HD (1080p) movies and ensure not a single moment of your action-packed lifestyle is missed. Don't just share some photos with friends, put them inside the action with you. Imagine reliving the downhill snowboarding rush, the incredible view as you hang glide down a 4,000-foot peak or showing your friends exactly what it was like to ”shoot the tube” in Hawaii. Attach the AW100 to your gear, and with a single touch of the control you're creating an in-the-action Full HD (1080p) movie with stereo sound. You'll capture all of life's adventures from a whole new perspective—your own. Imagine you and a friend are white water rafting down an unfamiliar route. The AW100's rugged waterproof build can take the pounding action while you record photos and movies of this incredible adventure. Use the built-in GPS to track progress with Nikon View NX2 software, NIkon's myPicturetown® photo sharing site or Google Earth™. A built-in map lets you view your path, and the Electronic compass is an extra safety measure that can even help you ascertain which branch to take if there's a fork in the stream. Your geo-tagged photo travelogue will give you bragging rights as you share the adventure with your friends. More creativity at your fingertips—even if your fingertips are enclosed in ski gloves! The AW100's handy Action Control feature makes it easy to adjust specific camera settings. Wrapped up in the action with no time to change settings? The AW100 automatically adjusts camera settings. And if you're looking to add creativity, select in-camera effects such as black and white, or selective color. There's even an underwater mode to keep images colorful and properly exposed.